Hi Steemians! It is a pleasure to do my first auction in Steembay. ■ This time I start the auction with a low price of 0.01 SBD. 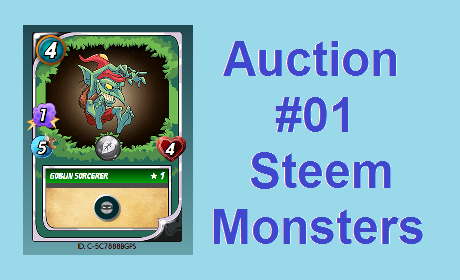 ■ You can see bellow the prices of a Goblin Sorcerer card in the Steem Monsters Market. ■ If you want you can increase your XP with this card for the Tournament. ■ Take advantage of this auction to get a cheap card. All you need to do is to be the high bidder. Thank you and successes for all! The winning bidder is @masterthematrix with an amount of 0.015 SBD - Congratulations! Congratulations on winning this auction! 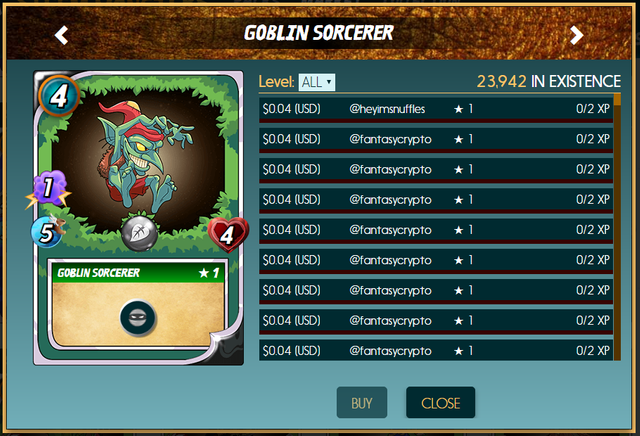 I sent the Goblin Sorcerer card to your Steem Monsters account. Feel free to pay and thank you! Great deal thanks for the auction! But I can't see the card that you send me? Its not in my Steemmonsters account and I can't see the transaction in my wallet? Here you can see. I sent the Goblin Sorcerer card to your Steem Monsters account. Ah ok when I use the Peakmonster Explorer than I can see the transaction. I thought it should also show up in my regular wallet and the Steemmonsters homepage didn't gave me a pop up. I send 0.015SBD right away thank you!!! I see. For that is Peakmonster. You are welcome and thank you, @masterthematrix! The bid was rejected because the amount is to low. The bid has to be higher than @rentmoney's bid of 0.011 SBD. The bid was rejected because the amount is to low. The bid has to be higher than @pizzachain's bid of 0.012 SBD.